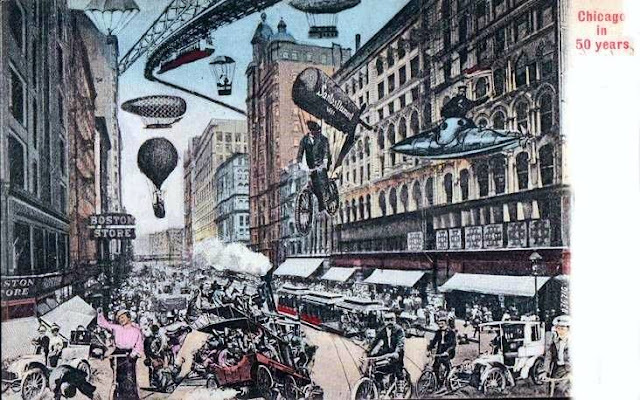 A future look from 1908 of Chicago's State Street in 50 years. A postcard of what they thought it would look like in 1958. The History of Chicagoan Mark Beaubien, the Hospitality Guru beginning in 1830. Mark Beaubien (1800-1881) born in Detroit, younger brother of Jean Baptiste; married Monique Nadeau (1800-1847), with whom he had 16 children, 14 of whom survived their mother; then married Elizabeth Mathieu, with whom he had seven children. builder of Chicago's first hotel. 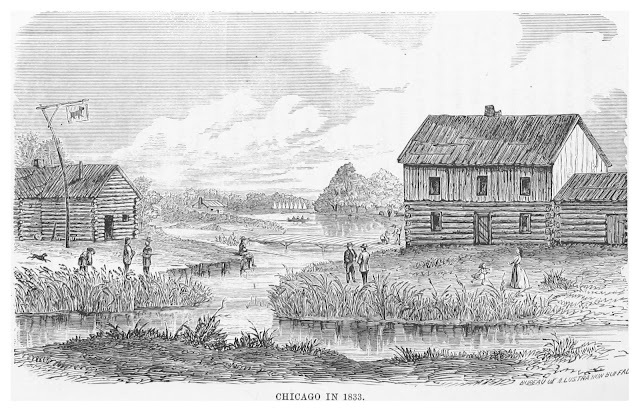 Mark came to Chicago in 1826 with Monique and children and purchased a small log cabin on the south bank of the Chicago River near the Forks from James Kinzie. In 1829 he began to take in guests, calling his cabin the "Eagle Exchange Tavern." A fun-loving fiddle player, he loved to entertain his guests at night, tempting one to believe stories about his knack for boyish mischief. Mark was licensed to keep a tavern on June 9, 1830 later voted on August 2nd. 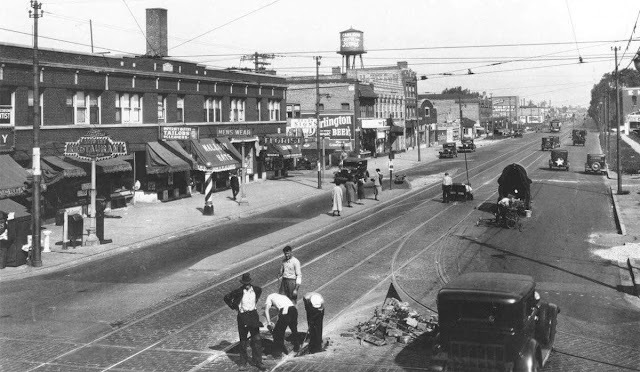 When the town plat was published that year, he found that his business was in the middle of a street and moved the structure to the south-east corner of Market street (North Wacker Drive) and Lake street. He purchased from the government in 1830 lots 3 and 4 in block 31 on which his building stood, as well as the small block 30, later selling part of the land to Charles A. Ballard. He was listed on the Peoria County Census of August 1830. In 1831 he built on a two-story frame house and called the structure the "Sauganash Hotel" (and Tavern, one of few grocery's with billiard tables) in honor of his friend Billy Caldwell, whose Indian name was Sauganash. On June 6, 1831, at the new county seat (Chicago), was granted a license to sell goods in Cook County and his cabin sold Indian goods (arts & crafts). In the late summer of 1832, he rented his original log cabin, adjacent to his "Sauganash Tavern," to newly arrived Philo Carpenter for use as - Chicago's 1st - drugstore. An ardent enemy of alcohol, Carpenter soon moved out. Mark next let the space to John S. Wright, and in 1833, the cabin became a school under Eliza Chappel's direction. Mark and Mark, Jr. were listed among "500 Chicagoans" on the census which Commissioner Thomas J.V. Owen took prior to the incorporation of Chicago as a town in early August 1833, and Mark was one of the "Qualified Electors" who voted to incorporate the town and on August 10 voted in the first town election. He received $500 in payment for a claim at the Chicago Treaty in September. Mark became the first licensed ferry owner, and in 1834 he built his second hotel, the "Exchange Coffee House," at the northwest corner of Lake and Wells streets. He placed an ad in the Dec. 21, 1835, Chicago Democrat that read: "I Mark Beaubien, do agree to pay 25 bushels of Oats if any man will agree to pay me the same number of bushels if I win against any man's horse or mare in the town of Chicago, against Maj. R.A. Forsyth's bay mare, now in Town." Listed in the 1839 City Directory as hotel-keeper, Lake Street. In 1840, Mark moved to Lisle Illinois with his family where he acquired farmland from William Sweet south of Sweet's Grove and also a cabin located immediately west of the Beaubien Cemetery (small cemetery on land set aside by Mark Beaubien on Ogden Avenue in Lisle). The cabin soon became Beaubien Tavern while it was still home to the residing family. 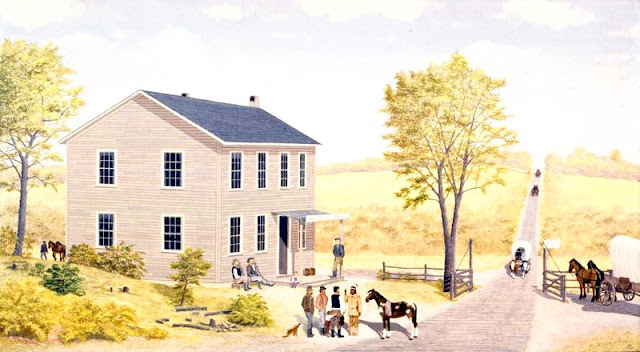 The Beaubien Tavern, depicted by local painter Les Schrader, was the site of a toll station on the Southwest Plank Road that ran through Lisle to Chicago and later became Ogden Avenue. Mark was also listed in the 1843 Chicago City Directory as U.S. lighthouse keeper. From 1851 to 1857 he used the Beaubien Tavern building as a toll station for the Southwest Plank Road (running from Lisle to Chicago), with his son collecting the toll. Later, during 1859 and 1860, he was again the lighthouse keeper in Chicago. His address in 1878 was in Newark in Kendall County. During the last 10 years of his life, he was troubled by failing memory, much to his chagrin because he loved to tell stories of the past; he was happiest in the company of old friends. Mark died on April 11, 1881, in the home of his daughter Mary and son-in-law, Georges Mathieu, at Kankakee and was buried with his second wife in St. Rose Cemetery, the oldest portion of Mound Grove. His fiddle is preserved at the Chicago History Museum. In the early days, while Mr. Beaubien kept a tavern, possibly the old Sauganash Tavern, when emigration from the east began to pour forth the stream which has not yet subsided, Mark's loft, capable of storing half a hundred men, for a night, if closely packed, was often filled to repletion. The furniture equipment, however, for a caravansary so well patronized, it is said, was exceedingly scant; that circumstance, however, only served to exhibit more clearly the eminent skill of the landlord. With the early shades of an autumn eve, the first men arriving were given a bed on the floor of the staging or loft, and, covering them with two blankets, Mark bade them a hearty good-night. Fatigued with the day's travel, they would soon be sound asleep, when two more would be placed by their side, and the aforesaid "two blankets" be drawn over these new comers. The first two were journeying too intently in the land of dreams to notice this sleight of hand feat of the jolly Mark, and as travelers, in those days, usually slept in their clothes, they generally passed the night without great discomfort. As others arrived, the last going to bed always had the blankets; and so it was, that forty dusty, hopeful, tired, and generally uncomplaining emigrants or adventurous explorers, who went up a ladder, two by two, to Mark Beaubien's sleeping loft, were all covered with one pair of blankets. It is true, it was sometimes said, that in a frosty morning there were frequently charges of blanket-stealing, and grumbling was heard, coupled with rough words similar to those formerly used by the army in Flanders; but the great heart of Mark was sufficient for the occasion, for, at such times, he would only charge half price for lodging to those who were disposed to complain. Personal Letter Excerpts from Benjamin Barker to his brother Jacob Barker as Chicago incorporates as a town in 1833. On September 6, 1832, Benjamin F. Barker was renting a cabin for $3 a month at Chicago and by letter to his brother (Jacob) in the East, reported that money was plentiful and requested he send salt and flour. By January 1833 he chopped wood to feed his family, the only work available and observed that the situation of the Indians was desperate, thousands were starving. In March he rented a farm eight miles north and asked for a strong wagon and barrels of salt. Barker was listed as a subscriber to the Chicago Democrat in November. 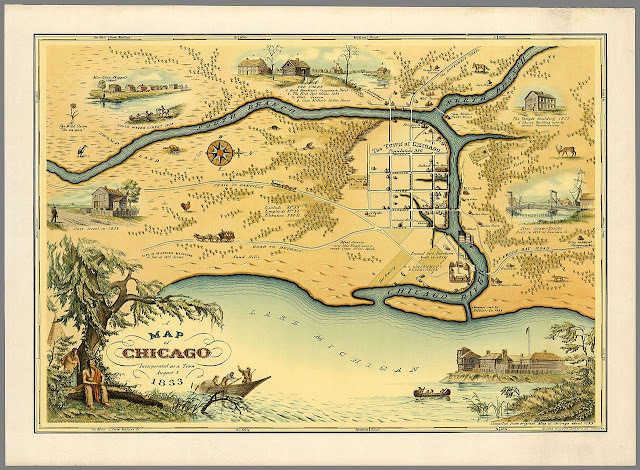 Chicago incorporates as a town on August 12, 1833 with a population of 350. In February of 1834 Benjamin hauled wood to town with a small wagon and oxen and requested a stock of dry goods be sent. By March he owned a shop in town and had built a house for his family. Reporting in May that competition was great and liquor was in great demand. At the end of July he wrote from Juliet [Joliet] - money was scarce in Chicago where a grocery existed on every corner, and the country was delightful. Letters to Jacob A. Barker are preserved at the Chicago History Museum. Ordinances of the Town of Chicago incorporated on August 12, 1833. The following ordinances are those passed by the trustees, presented in summary language and in chronological order, based on the complete text published in the Chicago Democrat Newspaper. Only the first 16 were numbered. Defines town limits: Jefferson St. on the W; Ohio St. [and both eastern and western projections thereof] on the N; Lake Shore and Fort Dearborn Reservation [E]. Names four streets S of Washington St.: Madison, Monroe, Adams, Jackson. Makes restraining of pigs in the village streets a requirement. Makes the shooting of a firearm within the village a punishable offence. Makes the removal of timber from either Chicago bridge an offence. Regulates the fireproof passing of stovepipes through the walls or roof of any house. Regulates the running of horses through the streets. Prohibits the "indecent exhibition" of stallions within the town limits. Prohibits dumping of garbage, construction material, & c. in village streets. Prohibits dumping of dead animals into the river. Passed Dec. 4, 1834, at the house of Dexter Graves. Names George W. Snow as assessor & surveyor of the town. Sets the town-tax collector`s compensation at 10 percent of the tax roll. Creates a bridge maintenance committee, appointing G.W. Dole, Medore B. Beaubien, Edmund S. Kimberly, and John Miller. Makes John Dean Caton town attorney. [15, 16] Regulates the use of riverfront property and the application process for wharfing privileges. · Details the duty of the assessor regarding taxable property. · Details the duty of the supervisor of streets. · Empowers the supervisor of streets to draft male residents between the ages of 21 and 60 for the duty of street repair, three days a year. · Levies a tax of quarter of 1 percent on all taxable property for the year 1834. · Instructs the surveyor to graduate South Water Street such that water will flow N into the river. · Gives instructions to the tax collector. · Further details the duties of the tax collector, including the requirement to post a bond. · Orders the town attorney to prosecute all offences of the previous ordinance. · An ordinance to prevent fire. [Sec. 1] Divides the town into four wards as follows: E of LaSalle St. and between Jackson and South Water—first ward; N of Jackson and between LaSalle and East Water—second ward; N of the river—third ward; W of the north and south branches of the river—fourth ward. [Sec. 2] Appoints firewardens, one for each ward: (1) William Worthingham, (2) Edward E. Hunter, (3) Samuel Resigue, and (4) James Kinzie. [Sec. 3] Regulates the fireproof passing of stovepipes through the walls or roof of any building. [Sec. 4] Describes the duty and authority of the firewardens. [Sec. 5] Sets fines for violators. [Sec. 6] Repeals the earlier fire ordinance of Nov. 6, 1833 (Ordinance Six). · Makes it unlawful to remove dirt or sand from any of the town streets, unless for the purpose of repairing those streets by order and permission of the supervisor of streets. [Sec. 1] Further details the authority and duty of firewardens. [Sec. 2] Makes the warden, in whose ward a fire breaks out, "Warden in Chief," subjecting the other three wardens to his authority. [Sec. 3] Assigns a numbered badge or plate to each firewarden, designating his ward, to be worn on his hat. · An ordinance for the further prevention of fires. Makes it unlawful to carry or convey firebrands or coals of fire between buildings within the town limits, unless transported in a covered earthen or fireproof container. [Sec. 1] Declares that anyone guilty of violating the laws and ordinances herewith can expect penalties. [Sec. 2] Makes it unlawful to place obstacles (timber, stone, &c.) on public passages (streets, sidewalks, &c.) without permission of president or trustee, except for those related to building construction, and then may only block one half of the passage for no longer than two months. [Sec. 3] Makes it unlawful to place casks or crates on the walkway in front of a building further than four feet, or in the street, unless with permission. [Sec. 4] Makes it unlawful to for any animal, wagon, or cart to cross a sidewalk, unless to enter a lot or yard. [Sec. 5] Makes it unlawful to ride or drive over a bridge faster than at the pace of a walk. [Sec. 6] Makes it unlawful for anyone to damage pavements, walks, sewers, drains, or to dig holes or ditches without permission, or to obstruct repair. [Sec. 7] Makes it unlawful to dispose anything (e.g. straw shavings) into sewers, drains or ditches, obstructing its purpose. [Sec. 8] Makes it unlawful to possess a billiard table, nine or ten pin alley for public use without a specific license. [Sec. 9] Makes it unlawful for an owner with a billiard table, gambling equipment, or liquor for sale, to allow the gaming house to become disorderly. [Sec. 10] Makes it unlawful to conduct oneself disorderly, to riot, to create a disturbance in the streets within the town, or to form crowds for unlawful purpose. [Sec. 11] Makes it unlawful to dump on streets or into the river any dead animals or putrid meat, fish entrails, decaying vegetables, or any other offensive substance. [Sec. 12] Makes it unlawful to dump any "nuisance" into any lot. [Sec. 13] The president or any trustee, on finding "any nuisance" in the street or in any lot, may order the perpetrator to remove it. [Sec. 14] Makes it unlawful to any grocery or "tippling house" to sell beer on the "Sabbath, or first day of the week." [Sec. 15] Makes it unlawful to burn hay, straw, chips, or any combustible material in any street or in any lot without permission from a trustee. [Sec. 16] Chips or other combustible material accumulating within buildings must be removed at least once a week. [Sec. 17] Makes it unlawful to dump chips or other combustible material on streets. [Sec. 18] Redefines how stovepipes must be passd through the roof or wall of buildings. [Sec. 19] Forbids the carrying of open fire through streets or lots. [Sec. 20] Forbids fireworks or the firing of guns within town limits. [Sec. 21] Creates firewardens for each district and defines their duties. [Sec. 22] Forbids the stacking of hay in the area bordered by Washington, Canal, and Kinzie streets, and the lake. [Sec. 23] Sets penalties for the offenses against the foregoing ordinances. [Sec. 1] Sets the time when the trustees appoint three inspectors of elections, attendant to the annual election of trustees and all special town elections. [Sec. 2] Sets the time of polling in such elections; declares poll lists to be kept in the same manner as that of the state law. [Sec. 3] Describes inspectors` responsibilities following elections, compliant with state law. [Sec. 4] Specifies the inspectors` filing of canvasses with the clerk of the county court circuit. [Sec. 5] Designates special elections to fill vacancies in the offices of trustees. [Sec. 6] Authorizes trustees to appoint from time to time as many police constables as they may think proper. [Sec. 7] Directs trustees to chose time and place of their meeting by resolution. Makes the president the presiding officer and gives him "only a casting vote." [Sec. 8] "The trustees shall meet annually hereafter on or before the second Tuesday in June and by ballot appoint a president, clerk treasurer, attorney, street commissioner, police constable, collector of taxes, and town surgeon, two measurers of wood, two measurers of lumber, two measurers and weighers of grain, and such other officers as the trustees may deem necessary for the good of said town: if for any cause the above officers are not appointed on the day above mentioned, the trustees may adjourn from day to day until they are appointed." [Sec. 9] Requires that bonds be filed by the treasurer, street commissioner, and collector(s) of a height deemed appropriate by the trustees. [Sec. 10] Describes the duties of the police constable, which includes the duty "to attend all fires within the limits of said town." [Sec. 11] Describes the duties and the powers of the trustees, which includes the power "to arrest all dissolute and riotous persons." [Sec. 12] Defines the duties of town assessor. [Sec. 1] Declares that anyone guilty of breaching the laws and ordinances herewith can expect penalties. [Sec. 2] The fire department consists of the chief engineer, two assistants, four wardens, in addition to trustees (all ex-wardens) and (as many as appointed by trustees) fire engine men, hose men, hook and ladder and axe and saw men. [Sec. 3] Details the chief engineer`s responsibilities. [Sec. 4] Details the assistant chiefs` responsibilities. [Sec. 5] Details the firewardens` assignment and responsibilities. [Sec. 6] Fire companies—"The firemen shall be redivided into companies, to consist of as many members as the Board of Trustees shall from time to time direct, to attend to the fire engines, hose carts, hooks and ladders, axes, saws, and other fire apparatus, belonging to the Town of Chicago; and each of the companies shall on the first Monday of December in each year, choose from among their own numbers a Foreman, Assistant Foreman, and Clerk, in such manner as they think proper." [Sec. 7] Details each company`s responsibilities and duties. [Sec. 8] Details the foreman`s responsibilities. [Sec. 9] Declares that any neglect, inattendance or apparatus maintenance failure will result in penalty. [Sec. 10] Declares that any neglect of assistance without sufficient excuse will result in penalty or expulsion. [Sec. 11] Declares that misuse of apparatus for private purpose will result in penalty. [Sec. 12] Defines in principle the required headgear: black leather cap with identification in white. [Sec. 13] Details the numbers and responsibilities of the hook, ladder, axe, and saw men. [Sec. 14] Regulates fire attendance. [Sec. 15] Details the state of readiness of fire equipment. [Sec. 16] Specifies fine if a fireman is absent when needed. [Sec. 17] Defines required headgear for hook, ladder, axe, and saw men: black leather cap with identification in white. [Sec. 18] Addresses the numbers of fire hose men selected. [Sec. 19] Describes the fire hose men`s responsibilities. [Sec. 20] Specifies the hierarchy among fire hose men. [Sec. 21] Defines required headgear for fire hose men: black leather cap with a coil pictured and identification in white. [Sec. 22] Defines the badges of office at fires—the president and trustees each to carry a staff with gilded flame atop. [Sec. 23] Defines required headgear: white leather cap with Chief Engineer in black. [Sec. 24] Defines required headgear: white leather caps with Engineer No. 1 and Engineer No. 2 in black. [Sec. 25] Defines required headgear: brim hat, white crown with warden in black; also to carry a white trumpet. [Sec. 26] Defines required headgear: black leather cap with Foreman and engine company identification in white. [Sec. 27] Defines required headgear: black leather cap with "Foreman" and hook and ladder company identification in white. [Sec. 28] Defines required headgear: black leather cap with Assistant and identification in white. [Sec. 29] Declares that any fireman neglectful of his responsibilities will be noted. [Sec. 30] Describes the duties of the constable during a fire. [Sec. 31-33] Declares town residents subject to and under the authority of the fire warden during a fire. [Sec. 34] Details the penalty for damaging town firefighting equipment. [Sec. 35-37] Requires residents to keep leather fire buckets in their buildings, buckets that are painted and labeled with the owner`s name or initials; instructs residents when to use them. [Sec. 38] Designates Attorney E.W. Casey, Supervisor of Roads and Bridges Edward E. Hunter, and the firewarden to handle all cases in which a resident contests a penalty. [Sec. 39] Lowers penalty for stacking hay within the town limits from $25 to $5. [Sec. 40] Specifies locations for the public posting of ordinances. [Sec. 41-44] Sets election rules. [Sec. 45] Declares that unexpected vacancies in offices must be filled by special election. [Sec. 46] Authorizes the board of trustees to appoint police constables as needed. [Sec. 47] Authorizes the board of trustees to determine when they will meet. [Sec. 48] Sets the appointment date for town officials on or near the second Tuesday in June. [Sec. 49] Requires that the treasurer, the commissioners, and the tax collectors be bonded. [Sec. 50] Defines the duties of the town constable. [Sec. 51] Defines the duties of town trustees. Antoine Ouilmette, Chicago's First Resident (July 1790-1826). The first settler of Evanston and Wilmette (1826-1838) with a brief history of the Ouilmette reservation. The primeval beauty of that ancient forest that stood on the western shore of Lake Michigan immediately north of Chicago, and covering the ground that now constitutes the northern portion of the City of Evanston and the Village of "Wilmette, has passed away. Many of its towering elms and great oaks that have stood for centuries of time remain to indicate in some measure what was the real beauty of that forest in the days when this Illinois country was unknown to white men. In the place of much of that forest stand costly dwellings; public buildings; paved streets and all the evidences of individual and public effort that illustrate so graphically the advance of our western civilization, and especially the rapidity of growth and enterprise of Chicago and its suburbs. There is probably no spot in America where such rapid and marked change has taken place, for there are many young residents of that part of Illinois known in these later days as the "North Shore" who have observed step by step these changes that have transformed this wild woodland into the suburban home of thousands of Chicago's citizens. In the midst of this former forest was the "Ouilmette Reservation." Those two quoted words have a peculiar significance to the few old settlers yet living who knew Antoine Ouilmette and his Pottawatomie squaw Archange. To the few lawyers and others who have to do with land titles and county records they indicate only the legal description of a tract of land. It is my purpose to relate as briefly as possible what I have been able to learn of its first proprietors. The Ouilmette Reservation and its former occupants and owners have been the subject of much solicitude and investigation, not entirely for historical purposes, but more especially that the white man might know that he had a good white man's title to the Indian's land. 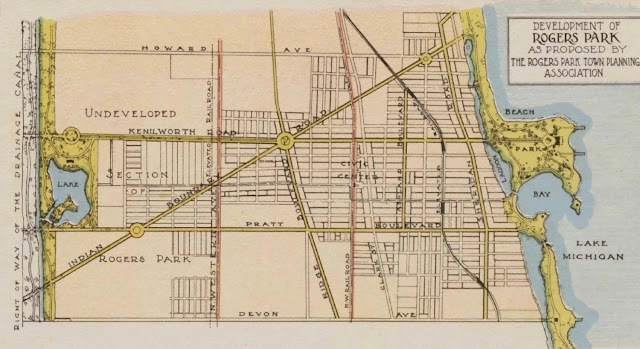 The Chicago Genealogist describes the Ouilmette reservation as having been 1580 acres large, of which "some" 300 now fall into the city limits of Evanston, and 1280 fall into Wilmette. The borders are given as follows: southern boundary at Central Street in Evanston or a line due west from the Evanston light-house; eastern boundary at the lake shore; northern boundary at the level of Elmwood Avenue (Elmwood Avenue, formerly North Avenue) in Wilmette, a little south of Kenilworth; and the western boundary at the western terminus of the present street-ear line on Central Street in Evanston and Fifteenth Street in Wilmette. The Reservation takes its name from its original owner, Archange Ouilmette, wife of Antoine Ouilmette, described in the original Treaty and Patent from the United States as a Pottawatomie woman. The name given the village—Wilmette—originates from Antoine himself and from the phonetic spelling of the French name " 0-u-i-l-m-e-t-t-e," and is said upon good authority to have been first suggested as the name of the village by Judge Henry W. Blodgett, late of Waukegan, who was interested in the very early real estate transactions of the village. There are many interesting facts regarding Ouilmette and his family. Antoine, the husband, was a Frenchman, who, like many of his countrymen, came to the West in early days and married an Indian wife. He was one of the first white residents of Chicago; some of the authorities say that, with the exception of Marquette, he was the very first. He was born at a place called Lahndrayh, near Montreal, Canada, in the year 1760. His first employment was with the American Fur Company, in Canada, and he came to Chicago in the employ of that company in the year 1790. 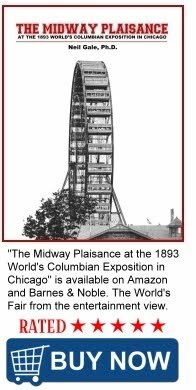 This striking figure in our local history, and in the very early history of Chicago, is sadly neglected in most, if not all, the historical writings. Almost everyone in this locality knows that the Village of Wilmette was named after him; many misinformed people speak of Ouilmette as an Indian chief; a few of the writers merely mention his name as one of the early settlers of Chicago. And that has been the beginning and end of his written history. Ouilmette's occupation cannot be more definitely stated than to say that, after his employment by the American Fur Company, he was an employee of John Kinzie at Chicago, and thereafter in turn Indian trader, hunter and farmer. He was a type of the early French voyageurs, who lived and died among their Indian friends, loving more the hardships and excitement of the Western frontier than the easier life of Eastern civilization. Archange Ouilmette, wife of Antoine, was a squaw of the Pottawatomie tribe, belonging to a band of that tribe located at the time she was married at "Gross Point," or what is now Evanston and Wilmette, although the band were constant rovers over the territory which became later the states of Illinois, Michigan, Indiana and Wisconsin. While Archange was of the Pottawatomie tribe, her father, it is said by one authority, was a white man, a trader in the employ of the American Fur Company, and a Frenchman, bearing the rather striking name of Francois Chevallier. Archange was born at Sugar Creek, Michigan, about 1764, and died at Council Bluffs, Iowa, in 1840. If a detailed account of all Ouilmette saw and did could be written we would have a complete history of Chicago, Evanston and all the North Shore, during the eventful fifty years intervening between 1790 and 1840, and it is certain that he and his family bore no unimportant part in the history of Illinois during that half century of time. “My home affairs are such that I cannot leave to see you at present. I cairn into Chicago in the year 1790 in July witness old Mr. Veaux... and Mr. Griano... These men were living in the country before the war with the Winnebago’s. Trading with them I saw the Indians break open the door of my house and also the Door of Mr. Kinzie's House. At first there was only three Indians come. They told me there was forty more coming and they told me to run. I Did So. In nine days all I found left of my things was the feathers of my beds scattered about the floor, the amount destroyed by them at that time was about Eight hundred Dollars. Besides your father and me had about four hundred hogs destroyed by the Siam Indians and nearly at the same time, further particulars when I see you. I wish you to write me whether it is best for me come there or for you to come here and how soon it must be done." The original letter was furnished to Mr. Blanchard by Mrs. Eleanor Kinzie Gordon of Savannah, Georgia, a daughter of John H. Kinzie. Ouilmette owned and occupied one of the four cabins that constituted the settlement of Chicago in 1803. The other residents were John Kinzie, Thomas Burns and Charles Lee (or Charles Leigh who also owned a cabin at Hardscrabble - today's Bridgeport community of Chicago). "The next day after Black Partridge, the Pottawatomie Chief, had saved the life of Mrs. Helm in the massacre on the lakeshore [commemorated by the monument recently erected at the place], a band of the most hostile and implacable of all the tribes of the Potawatomis arrived at Chicago and, disappointed at their failure to participate in the massacre and plunder, were ready to wreak vengeance on the survivors, including Mrs. Helm and other members of Mr. Kinzie's family. Mrs. Kinzie says. Black Partridge had watched their approach, and his fears were particularly awakened for the safety of Mrs. Helm (Mr. Kinzie's step-daughter). By his advice she was made to assume the ordinary dress of a French woman of the country. In this disguise she was conducted by Black Partridge himself to the house of Ouilmette, a Frenchman with a half-breed wife, who formed a part of the establishment of Mr. Kinzie, and whose dwelling was close at hand. It so happened that the Indians came first to this house in their search for prisoners. As they approached, the inmates, fearful that the fair complexion and general appearance of Mrs. Helm might betray her for an American, raised a large feather bed and placed her under the edge of it, upon the bedstead, with her face to the wall. Mrs. Bisson, the Bister of Ouilmette's wife, then seated herself with her sewing upon the foot of the bed." It was a hot day in August, and Mrs. Helm suffered so much from her position and was so nearly suffocated that she entreated to be released and given up to the Indians. "I can but die," said she. "Let them p^^t an end to my misery at once." When they assured her that her discovery would be the death of them all, she remained quiet. "The Indians entered and she could occasionally see them from her hiding place, gliding about and stealthily inspecting every part of the room, though without making any ostensible search, until apparently satisfied that there was no one concealed, they left the house... All this time Mrs. Bisson had kept her seat upon the side of the bed, calmly sorting and arranging the patch work of the quilt on which she was then engaged and preserving the appearance of the utmost tranquility, although she knew not but the next moment she might receive a tomahawk in her brain. Her self-command unquestionably saved the lives of all present... From Ouilmette's house the party proceeded to the dwelling of Mr. Kinzie." The Indians had just left Ouilmette's house when one Griffin, a non-commissioned officer, who had escaped and bad been concealed among the current bushes of Ouilmette's garden, climbed into Ouilmette's house through a window to hide from the Indians. "The family stripped him of his uniform and arrayed him in a suit of deer skin with belt, moccasins and pipe, like a French engage," in which disguise he also escaped. After the massacre, when John Kinzie and all the other white settlers and their families, fled from the place, Ouilmette and his family remained, and he was the only white resident of Chicago for the following four years, 1812 to 1816. The reason for their thus remaining was on account of their friendly relationship with most, if not all, the Indian population. 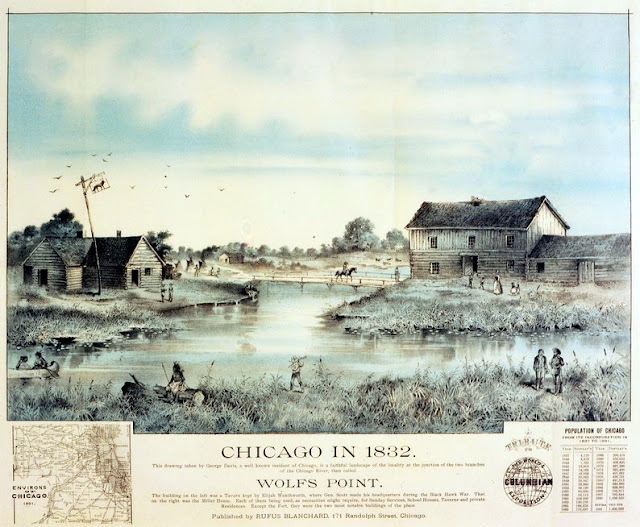 In 1814 Alexander Robinson (afterwards chief of the Potawatomis), came to Chicago, and he and Ouilmette cultivated the field formerly used as the garden of old Fort Dearborn. They raised good crops of corn and sold the crop of 1816 to Captain Bradley, after his arrival at Chicago to rebuild the fort. 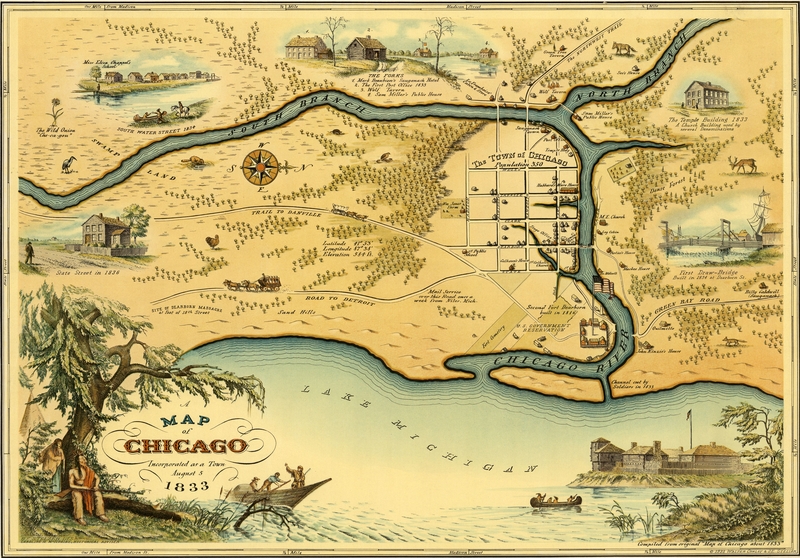 ​In the summer of 1820, a traveler named John Tanner passed through Chicago with his family, going by canoe to St. Louis. In Tanner's narrative, he recounted how his progress was hailed by the low state of water in the Illinois River. During this time he suffered greatly from illness and destitution. He was rescued from his plight by Antoine Ouilmette, who had been able to carry some boats across the portage. Although his horses were gravely worn from their long journey, he agreed, for a moderate price, to transport Tanner and his canoe 60 miles - and if his horses should hold out, twice the distance or the length of the portage at this stage of the river. In addition he lent Tanner, who was weak from illness, a young horse to ride. Before 60 miles had been traversed, Ouilmette was himself taken sick, and as there was now some water in the river, Tanner dismissed him and attempted to descend the river in his canoe. He was still in Chicago in 1821. He had horses and oxen and other stock in abundance. In the early days he kept a small store in Chicago, and used to tow boats into the Chicago River with his ox teams. He also furnished the Fort Dearborn garrison with meat and fuel and carried on trading operations with the Indians along the North Shore from Chicago to Milwaukee and in Canada, where he frequently went. Mrs. Archibald Clybourne says that Ouilmette raised sheep when he lived in Chicago, and that her mother, Mrs. Galloway, used to purchase the wool of him with which she spun yarn and knit stockings for the Fort Dearborn soldiers. Ouilmette was a thrifty Frenchman. His name was on the first Chicago tax list from Jukly 25, 1825. Ouilmette was assessed on $400 of personal property that included cows, horses, sheep, wagons, and farm implements, and paid $4 in taxes. With one exception none of the fourteen tax payers of that year owned property in excess of $1,000. John Kinzie's holdings appear on the same roll as worth $500, while those of John B. Beaubien are set down at $1,000; the lowest man on this list is Joseph La Framboise, who paid 50 cents on property valued at $50, and Ouilmette’s taxes appear considerably above the average in amount. He also appears as a voter upon the poll book of an election held at Chicago on August 7, 1826, at which election it is said he voted for John Quincy Adams for President, which is the last record of his residency in Chicago. Ouilmette was a Roman Catholic. In April, 1833, he joined, with Alexander Robinson, Billy Caldwell, several of the Beaubiens and others, in a petition to the Bishop of the diocese of Missouri, at St. Louis, asking for the establishment of the first Catholic Church in Chicago. The petition (written in French) says: "A priest should be sent there before other sects obtain the upper hand, which very likely they will try to do." The early enterprise of the church is demonstrated by the fact that the petition was received on April 16 and granted the next day. The seventy-fifth anniversary of the founding of this church was celebrated with great ceremony this year (1908) in Chicago. This circumstance, in 1833, and many others, seem to indicate that even after Ouilmette's removal from Chicago to the North Shore he and his family remained intimately associated with affairs in Chicago. Mrs. Kinzie took Ouilmette's daughter Josette with her to the Indian agency of which her husband was in charge at Old Fort Winnebago, in Wisconsin, on her return from Chicago in 1831. She describes her as "a little bound girl, a bright, pretty child of ten years of age. She had been at the Saint Joseph's Mission School." Mrs. Kinzie at the time of the Black Hawk War (1832) fled from Fort Winnebago to Green Bay in a canoe and took this same little Josette Ouilmette with her. That Josette was a protégé of the Kinzie family, and that they took a lively interest in her welfare, further appears from the Treaty of 1833 with the Potawatomis at Chicago. She is personally provided for, probably at the demand of the Kinzies, in the following words: "To Josette Ouilmette (John H. Kinzie, Trustee) $200." The other children did not fare so well, for the treaty further provides "To Antoine Ouilmette's children $300." It also seems that the kindness of the Kinzies to Josette was not entirely appreciated by the Ouilmettes. Mitchell Ouilmette, on May 2, 1832 (as John Wentworth says), enlisted in the first "militia of the town of Chicago until all apprehension of danger from the Indians may have subsided"—probably referring to the Black Hawk "War. Mr. Wentworth's authority is a copy of the enlistment roll, where, in transcribing the copy, his name is stated as "Michael," an evident mistake in transcribing from the original signature. While it is true that Captain Heald of Fort Dearborn was notified on August 7 or 9, 1812, of the declaration of war against England by a message carried by the Pottawatomie chief, Win-a-mac, or Winnemeg (the catfish), from General Hull at Detroit, warning Captain Heald that the Post and Island of Mackinac had fallen into the hands of the British, of the consequent danger to the Chicago garrison and the probable necessity of retiring to Fort Wayne, still it is stated upon fairly good authority that Louis Ouilmette, son of Antoine, when a mere boy, learned the same facts from a band of Indians on the North Shore, coming either from Mackinac or from that vicinity, and at once carried the information to the garrison several days before the arrival of Win-a-mac. Some twenty years later this same Louis Ouilmette rendered further substantial aid to the whites in the Black Hawk War. Mr. Frank E. Stevens, in his recent book (1903), "The Black Hawk War," seems to be the only writer who has given him the deserved though tardy recognition to which he seems to be so well entitled. He is there spoken of as "a French trader, thoroughly familiar with those parts (Western Illinois and Wisconsin) and with Indian character." It seems that at this time he was a trader frequenting La Sallier's Trading Post, Dixon's Ferry and other points in that vicinity, rendered valuable assistance as an Indian interpreter and scout. From the foregoing facts it is evident that Ouilmette located in Chicago in 1790, and lived there for some thirty six years, and that, as will be shown later, sometime between 1826 and 1829 he located within the present limits of Evanston or Wilmette Village, and certainly within the Reservation. OUILMETTE AND FAMILY ON THE NORTH SHORE. ''Beginning on the western shore of Lake Michigan, at the northeast corner of the field of Antoine Ouilmette, who lives near Gross Point, about twelve (12) miles north from Chicago, thence due west to the Rock River," which is the first evidence I have found of Ouilmette 's permanent residence in this vicinity, although he was married to Archange in 1796 or 1797 at "Gross Point," or what is now Wilmette Village and Evanston, this being the first North Shore wedding of which there is any history. This latter circumstance would seem to clearly indicate that the band of Potawatomis to which Archange belonged was located more or less permanently at this point on the North Shore in the eighteenth century. 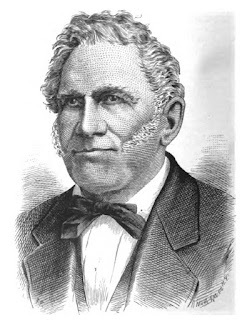 John "Wentworth says in his reminiscences that Ouilmette 's daughter, Elizabeth, married for her first husband on May 11, 1830, Michael Welch, "the first Irishman in Chicago." This wedding, with the son of Erin groom and the Pottawatomie bride, was celebrated in an old log cabin that stood until 1903 on the east side of Sheridan Road at Kenilworth and about two blocks north of the Kenilworth water tower. The writer took a kodak picture of this log cabin shortly before it was removed. This cabin was built by one John Doyle, who, considering his name and date of residence, may be safely designated "the first Irishman of the North Shore," for it is certain there are few living witnesses who can successfully dispute this statement, nor can any good reason be shown why the North Shore should not have its "first Irishman" as well as Chicago. The authority as to this being the house where the wedding was celebrated is Mr. Charles S. Raddin of Evanston, who secured the information some years ago from Mrs. Archibald Clybourne, who may have been present at the wedding, although Mr. Raddin neglected to ask her. Mr. Raddin was further neglectful in failing to get the name of the best man and maid of honor, and whether they were Irish or Pottawatomie. The ceremony was performed by John B. Beaubien, a justice of the peace, as is shown beyond question by the records of Peoria County. Ouilmette and his family lived in this cabin at the time of this wedding and for some time thereafter, although their most permanent abode was about a mile south of there, and will receive later mention. THE INDIAN TREATY OF PRAIRIE DU CHIEN JULY 29, 1829. ORIGIN AND HISTORY OF THE OUILMETTE RESERVATION. OUILMETTE'S PARTICIPATION IN THE INDIAN TREATIES. "To Archange Ouilmette, a Pottawatomie woman, wife of Antoine, two sections for herself and her children on Lake Michigan, south of and adjoining the northern boundary of the cession herein made by the Indians aforesaid to the United States... The tracts of land herein stipulated to be granted shall never he leased or conveyed by the grantees, or their heirs, to any person whatever, without the permission of the President of the United States." The land was surveyed by the government surveyors in 1842 and the patent therefor was issued October 29 of the same year. This treaty is of special historical interest. By it the United States acquired title from the Indians to all of the land within the city limits of Evanston and great tracts to the west, bounded as follows : Beginning at the north line of Ouilmette's reservation, or a little south of Kenilworth on the Lake Shore, due west to the Rock River, thence down the river and east of it to the Indian boundary line on Fox River, established by the treaty of 1816 ; thence northeasterly on that line to Lake Michigan, thence north along the lake shore to the place of beginning. Rogers Park Community of Chicago Street Map Showing Indian Boundary Road. This treaty also included a vast territory lying between the Mississippi River (the Indians called the Mississippi River, "Sinnissippi," meaning "rocky waters") and the Rock River in Illinois and Wisconsin, and was planned, it is said, with reference to the succeeding Treaty of Chicago in 1833 to finally clear Western Illinois and Southern Wisconsin of the Indians. "By its provisions the Indians became completely hemmed in, or surrounded. To use a common saying in playing checkers, the Indians were driven into the 'single corner' before they were aware of it." This treaty was the entering wedge, designed, as above stated, to eventually oust the Potawatomis and other tribes from Illinois and Wisconsin, and the manner in which its execution was secured reflects no credit upon our nation. If the writers who have investigated the subject can be relied upon, hardly any treaty with the Indians ever made is subject to more just criticism. "Mr. Robinson, when and how did you become a chief?" "Me made chief at the treaty of Prairie du Chien." "How did you happen to be made chief?" "Old Wilmette, he come to me one day and he say: Dr. Wolcott" (then Indian agent at Chicago, who Mr. Haines says, planned the deal) "want me and Billy Caldwell to be chief. He ask me if I will. Me say yes, if Dr. Wolcott want me to be." "After the Indians had met together at Prairie du Chien for the Treaty, what was the first thing done?" "The first thing they do they make me and Billy Caldwell chiefs; then we be chiefs... then we all go and make the treaty." Chiefs Robinson and Caldwell were handsomely taken care of, both in this treaty and subsequent ones, in the way of annuities, cash and lands, as were also their friends. Archange Ouilmette, Indian wife of the man designated by Chief Robinson as "Old Wilmette," and her children thus, according to Mr. Haines, secured the two sections of land constituting the Reservation under discussion and which seems to show, if Mr. Haines is correct, that Ouilmette was, indeed, as already stated, a thrifty Frenchman. There is ample ground, however, for disagreement with Mr. Haines in his voluntary criticism of Ouilmette in this transaction. It must be borne in mind that Ouilmette and his family were not only friendly to the whites during the stirring and perilous times at Chicago in the War of 1812 and also in the later Black Hawk War, but they themselves had suffered depredation at the hands of the Indians, as shown by Ouilmette's letter to John H. Eanzie. Then, too, he was occupying this very land, then of little value, and, considering his fidelity to the Government, notwithstanding his marriage to a Pottawatomie wife, it would seem that this cession of these two sections of land, under the circumstances, was entirely right and probably very small compensation for his friendly services. Then, too, it must be remembered that he did not get the land, but it went to his Pottawatomie wife and her children. Mr. Haines says of this transaction and Dr. Wolcott's and Ouilmette's connection with it: "In aid of this purpose, it seems he secured the services of Antoine Wilmette, a Frenchman, who had married an Indian wife of the Pottawatomie tribe, one of the oldest residents of Chicago, and a man of much influence with the Indians and a particular friend of Robinson's." It is fair to say that Mr. Haines excuses both Robinson and Caldwell for their action in the matter on the ground that they had long been friendly to the whites and were misled into believing that the integrity of their white friends was as lasting as their own. It is to be regretted that Mr. Haines did not express the same views as to Ouilmette, for history clearly demonstrates that he was richly entitled to it. This statement of Mr. Haines the writer called to the attention of Sophia Martell and her son, and we have his written reply thereto to the effect that "it is all rot,:" and that if it was true "Antoine Ouilmette would have received other and different lands for himself," and this reservation was theirs "by right," and "their share of lands allotted to the Potawatomis and to different families at that time." Ouilmette was also on hand when the Treaty of Chicago (1833) was negotiated, as he was at Prairie du Chien, for the treaty not only provides for the donations already mentioned to Chiefs Robinson and Caldwell, to Ouilmette's children and others, but he secured $800 for himself, as the treaty shows. Whether this was compensation for his hogs that had been "destroyed" some thirty years before by the Indians (mentioned by him in the Kinzie letter), or as further compensation for his prior services at Prairie du Chien or at Chicago in 1812, is not disclosed, but it certainly is evidence of his desire to see that his finances should not suffer in deals made with his wife's relations. The acquaintance of the first white settlers with the Ouilmette family on this reservation is of interest. To some of their reminiscences reference will here be made: In a letter written by Alexander McDaniel to the publishers of Andrea's History of Cook County (1884), and quoted in that work, Mr. McDaniel thus describes his first trip to the North Shore and his first observation of the Ouilmette family. "On the 14th of August, 1836, I left Chicago in the morning and about noon I brought up at the house of 'Anton' Ouilmette. The place was then called 'Gross Point,' being located about fourteen miles north from Chicago on the lakeshore. The house that the 'Wilmette' family then occupied was a large hewed log block-house, considered in those days good enough for a very congressman to live in, at least I thought so when I was dispatching the magnificent meal of vegetables grown on the rich soil, which the young ladies of the house had prepared for me. I was then a young man about twenty-one years old, and this being my first trip out of Chicago since I had come West, I naturally was curious to know more about my hosts. Upon inquiry I soon found out that the family consisted of Anton and Archange, the heads of the family, and their eight children, Joseph, Mitchell, Louis, Francis, Elizabeth, Archonce, Sophia and Josette, Lucius R. Darling, husband of Elizabeth, and John Deroshee, husband of Sophia; the father being a Frenchman and the mother a half-breed. The children were nearly white, very comely, well dressed and intelligent. Josette, in fact, had obtained quite a reputation as a beauty. The Ouilmettes owned cattle, horses, wagons, carriages and farming implements, working a large tract of land. "After leaving the family I passed along in a northwesterly direction to where Winnetka is now located. There I purchased the claim on 160 acres of Government land of Perry Baker and Simeon Loveland in March, 1837, built a house on the land and kept 'Bachelors' Hall' there for five years. I had occasion to become very well acquainted with my Indian friends and found them most agreeable neighbors." "About the time Mr. McDaniel settled at Winnetka... Charles H. Beaubien, a cousin of Mark, settled near the center of Section 27, on the place now occupied by Henry Gage. Charles Beaubien, like his cousin, Mark, was a great fiddler and always in demand at dances attended by the few blooming white girls of that vicinity and those of a duskier tinge. The Wilmette family were upon such occasions in almost as pressing demand as Beaubien himself." "Joseph Fountain, late of Evanston, now deceased, says in an affidavit dated in 1871 that when he first came here he lived with Antoine Ouilmette; that at that time he (Antoine) was an old man, about 70 years of age, and was living upon the reservation with his nephew, Archange, his wife, being then absent. That within a year or two thereafter the children returned and lived with their father upon the reservation. The children went away again and returned again in 1844. They were then all over lawful age, had usual and ordinary intelligence of white people and were competent to manage and sell their property. That he was acquainted with the children and their father and after their return assisted them in building a house to live in on the reservation. That during the last twenty (20) years the Indian heirs have not been back there. That in the years 1852 and 1853 the land was not worth over $3.00 per acre." "On inquiry in 1901 of Mary Fountain, Joseph Fountain's widow, a very old lady, (Mrs. Fountain died in Evanston, February 17, 1905.) and by like inquiry of Mr. Benjamin F. Hill (Benjamin F. Hill died in Milwaukee, Wisconsin, October 7, 1905, his residence up to that time, however, having been in Evanston) and others, the writer ascertained that this house of Ouilmette's just mentioned was built of logs, situated on the high bluffs on the lake shore, opposite, or a little north of Lake Avenue, in the Village of Wilmette, and that the former site of the house has long since and within the memory of old residents, been washed into the lake, many acres of land having been thus washed away. Mr. Hill says that this house was at one time occupied by Joel Stebbins, who used it as a tavern." In 1857 John G. Westerfield acquired that part of the reservation where this house stood and in the year 1865 "tore the old house down." "Quite a little grove that stood still east of the cabin site in 1857, when we first occupied the land, was also washed away. I remember that part of the logs of the Ouilmette cabin were used by father to build a cowshed on the old place; he also saved some of the parts as relics, but I presume they are now lost... I remember that my child-like curiosity was aroused on at least two occasions, as I watched a small squad of Indians turn out from the old Green Bay Road and go up to the old cabin and look it over as though they were familiar with it, and then again resume their tramp, up to about the year 1860-61, the passing of two or three Indians at a time along the Green Bay Road was a common occurrence." 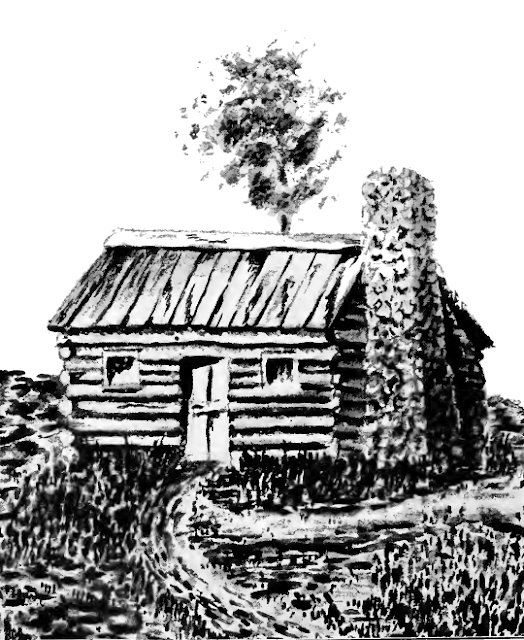 There is no photograph of this cabin known to be in existence but Mr. Westerfield has a very distinct recollection of its appearance and has at the writer's request kindly utilized both his recollection and ability as an artist, in supplying this society with a water color drawing of it. North Shore Residence of Antoine Ouilmette and Family (1828-1844). "On this spot stood the Log Cabin of Antoine Ouilmette, the first permanent white settler of Chicago (1790) and of the North Shore (1826-1841). He married a Pottawatomie woman of the band of that Indian tribe, located here in the 18th Century. To her and her children this land was granted as a Reservation by the Indian Treaty of Prairie du Chien, July 29, 1829. From him the Village of Wilmette derives its name." Within a very short distance of Ouilmette's cabin (about 100 feet north) was an Indian mound which had been used for burial purposes—not a large mound but a small one some 10 to 15 feet in length and about 4 feet in height—later this mound was obliterated in plowing of the field by farm hands of Mr. John Q. Westerfield and later by the washing away of the embankment by the action of the lake. One of Mr. Westerfield's employees, Daniel Mahoney while plowing with an ox team about the year 1857 or 1858 over and around this mound plowed up several implements including a small steel tomahawk now in the collections of this society. The affidavit of Mr. Fountain indicates that Ouilmette lived on the reservation until 1838. His letter of 1839 indicates a residence at Racine, at which place he had a farm for several prior years, and while living in Chicago, or at least a tract of land where he frequently went. Mr. Benjamin F. Hill says that he knew him about the year 1838; that he was then a very old man, rather small of stature, dark-skinned and bowed with age; that about that year he went away. He died at Council Bluffs, December 1, 1841. Mr. Hill says that Mr. Fountain omits in his affidavit one item concerning the acquaintance between Ouilmette and Fountain, viz., a lawsuit in which Ouilmette prosecuted Fountain and others for trespassing upon the reservation by cutting timber, Avhich resulted unfavorably to Ouilmette ; that there was a large bill of court costs, which Fountain's lawyer collected by having the sheriff' levy upon and sell a pair of fine Indian ponies belonging to Ouilmette, which were his special pride, and that it was immediately after this incident that Ouilmette left the reservation, never to return. In the years 1843 and 1844 "several of the family returned" to the reservation, "occupying the old homestead until July of the latter year." SALE OF THE RESERVATION BY THE OUILMETTE FAMILY. By a petition dated February 22, 1844, to the President of the United States, signed by seven of the children of Ouilmette (all except Joseph), it appears that Archange Ouilmette, the mother, died at Council Bluffs November 25, 1840, that six of the children signing the petition then resided at Council Bluffs, and one (probably the former little Josette) at Fort Winnebago, Wisconsin Territory; that in consequence of their living at a remote distance, the land is deteriorating in value "by having much of its timber, which constitutes its chief worth, cut off and stolen by various individuals living nearby," which would seem to indicate that people were not so good in those days in Evanston as they have been reputed to be in some later days, if the Chicago newspapers can be believed in this respect. The petition further says: "The home of your petitioners, with one exception, is at Council Bluffs, with the Pottawatomie tribe of Indians, with whom we are connected by blood, and that your petitioners cannot, with due regard for their feelings and interests, reside away from their tribe on said Reserve" also that they have been put to expense in employing agents, whose employment has not been beneficial. "Or, that your Excellency will cause the Government of the United States to purchase back from us said Reserve of land and pay us one dollar and twenty-five cents per acre therefor." "And your petitioners further show that they are now at Chicago on expense, waiting for the termination of this petition, and anxious to return home as soon as possible," and request action "without delay." As the result of this petition and subsequent ones, Henry W. Clarke was appointed a special Indian agent to make sale of the Reservation, or, rather, that part of it owned by the seven petitioners, so that a fair price could be obtained, and sale was made to real estate speculators during the years 1844 and 1845. In the correspondence between the various departments of the Government with reference to the sale, appear the signatures of John H. Kinzie, John Wentworth (then member of Congress), William Wilkins, Secretary of War; President John Tyler, W. L. Marcy, Secretary of War; also the signatures of President James K. Polk and Ulysses S. Grant. The south half of the Reservation, including all that is in Evanston (640 acres) sold for $1,000, or a little over $1.50 per acre. The north section was sold in separate parcels for a larger sum. The correspondence tends to show that the seven Ouilmette children carried their money home with them, but as the Special Indian Agent had no compensation from the Government and there were several lawyers engaged in the transaction, the amount that the Indians carried back to Council Bluffs can be better imagined than described. Joseph Ouilmette in the year 1844 took his share of the Reservation in Severalty, deeding the remainder of the Reservation to his brothers and sisters, and they in turn deeding his share to him. The share that he took was in the northeastern part of the reservation; he secured the best price in making a sale and seemed inclined, not only to separate his property interests from his brothers and sisters, but to be more of a white man than an Indian, as he did not follow the family and the Pottawatomie tribe to the West for several years, but adopted the life of a Wisconsin farmer, removing later to the Pottawatomie Reservation in Kansas, at which time he was a well-known man at Saint Mary's, Kansas. An affidavit made by Norman Clark, May 25, 1871, states that Joseph Ouilmette was in 1853 a farmer, residing on his farm in Marathon county, Wisconsin, "about 300 miles from Racine," and that the $460 he received for his share of the Reservation ' was used in and about the improvement of his farm," upon which he lived for about seven years, and that he was capable of managing his affairs "as ordinary full-blooded white farmers are"; that from 1850 to 1853 he carried on a farm within two miles of Racine, presumably on the land formerly owned by his father, Antoine. It appears from various recorded affidavits that all of the children of Ouilmette are now dead. Such affidavits must have been made from hearsay and with a view of extinguishing upon the face of the records all possible adverse claims, for, as heretofore stated, Sophia Martell was living at last accounts (1905) on the Pottawatomie Reservation in Kansas, at a very advanced age, but with a good memory that has served a useful purpose in supplying the writer with some of the facts here noted. With this exception, all of the children are dead, but many of their descendants are still living on this same Kansas Reservation, and several of them are people of intelligence and education, prizing highly the history of their ancestors. The only relic of Antoine Ouilmette in the hands of the Evanston Historical Society is an old chisel, or tapping gouge used by him in tapping maple trees in making maple sugar on the Reservation, at a point a little west and some two blocks north of the present Wilmette station of the Northwestern Railway, immediately west of Dr. B. C. Stolph's residence. This chisel or gouge was secured by Mr. Benjamin F. Hill in this sugar bush soon after Ouilmette went away, and there is not the slightest doubt of its being the former property of Ouilmette, for Mr. Hill was not only the John Wentworth of Evanston in the matter of being an early settler (1836), with a great fund of authentic information, but was a man of force and intelligence, of excellent memory and unquestionable integrity, and always interested in historical subjects, as his many valuable contributions to the Evanston Historical Society abundantly show. Mr. Edwin Drury of Wilmette Village, presented (1908) to this society a very curious relic found within a short distance of the former site of the Ouilmette cabin and of Mr. John G. Westerfield 's former residence, viz., a very odd piece of broken statuary, dug up by workmen in making an excavation. This broken image was found in a bed of blue clay, some three feet below the surface, immediately under a large wild crab apple tree, the age of which would seem to indicate that the soil had not been excavated nor disturbed for very many years. Whether Mr. Drury's suggestion that it might be a relic of the early Jesuits possibly of Father Pinet, who founded in this vicinity a mission among the Miami Indians in the year 1696, is a question respectfully referred to the local archaeologist. It is at all events an interesting object for study. The History of the Chicago Historical Society. Chicago in 1870, from the top of the Court House. A Brief History of the Chicago Tribune.